There are 4 mounting holes on a 0.875 inch diameter circle. Use 3mm screws. Caution: Do not allow the screws to penetrate the end ball more than 5mm. For geared applications, the rear of the motor should be supported. Use a collet type prop adapter for best prop retention. Setscrew types can slip at high power levels. When pressing a gear onto the motor shaft, always support the rear end of the motor shaft. Never press against the case alone. Use a product such as Loctite 609 to secure the gear. Always use a high quality speed controller appropriate to your application. 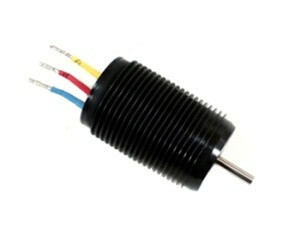 Use a brushless, sensorless speed control. To reverse the direction of rotation, reverse any two motor wires. Never plug the battery in backwards to the speed controller. This is a 4-pole motor. Use mild advance settings. The ESC must be supported to prevent vibration and motor wire breakage. Do not cut motor wires. Safety: Rotating parts such as propellers and helicopter blades can cause serious injury. Avoid contact. Always check the temperature of the motor in any new application. If it is running very hot, you may have too high a load or an incorrect setting in your ESC. Discontinue usage until the problem is solved. Always provide adequate cooling. Do not run without a load. Warranty: This warranty covers only failures due to defects in parts and workmanship for one year on the motor and 90 days on the gearbox for the original purchaser. Proof of the original purchase date is required. It does not cover normal wear and tear, crash damage, or damage caused by improper use. All warranty dispostions are handled by Diversity Model Aircraft.